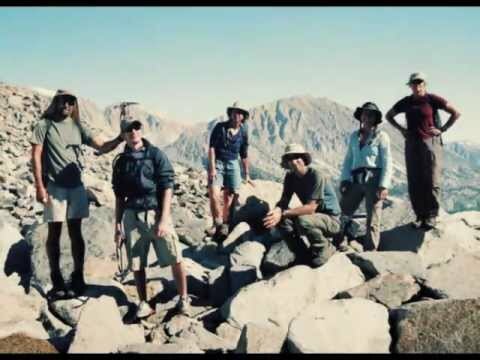 Founded by Deborah Northcutt in 1997, Wilderness Volunteers brings together a love of adventure and a desire to help and serve by organizing volunteers for the stewardship of public wild lands. 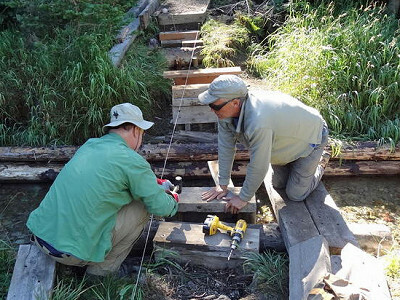 They have partnered with public land agencies including the National Park Service, the Forest Service, the Bureau of Land Management and the US Fish and Wildlife Service to take on backlog trail maintenance projects that without volunteered time and manpower would otherwise go undone. In 2012 alone, over 50 volunteer service projects contributed over half-a-million dollars of donated labor. Their service trip season runs from March to October, and each one week trip ranges in difficulty and remoteness of location. Land agencies provide tools and supervision, but all trips are organized and lead by Wilderness Volunteer leaders. There is a participation fee that covers all meals during the project. Each trip is designed to leave time to explore and enjoy the wilderness, and volunteers learn Leave No Trace outdoor living skills and ethics. Click on the button below to see where you can donate your time and energy to join in giving something back in wilderness lands across the country. Hi, My name is Aaron and I work here at The Grommet. I met Paul Goldberg, Wilderness Volunteer's Development Coordinator, while volunteering to clean Jordan Park in Salt Lake City. We cleaned for just over two hours and, bit by bit, collected what seemed like an inconsequential amount. Incredibly we were able to remove 118 lbs. of trash from the park and river. Now imagine what you can accomplish in one week? Wilderness Volunteers is an incredible organization that performs service projects with America's wild lands, making a tangible impact on the wilderness and the volunteers. 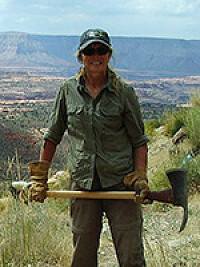 Founded by Deborah Northcutt in 1997, Wilderness Volunteers brings together a love of adventure and a desire to help and serve by organizing volunteers for the stewardship of public wild lands. 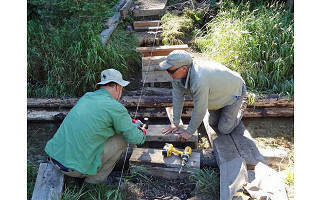 They have partnered with public land agencies including the National Park Service, the Forest Service, the Bureau of Land Management and the US Fish and Wildlife Service to take on backlog trail maintenance projects that without volunteered time and manpower would otherwise go undone. In 2012 alone, over 50 volunteer service projects contributed over half-a-million dollars of donated labor. Their service trip season runs from March to October, and each one week trip ranges in difficulty and remoteness of location. Land agencies provide tools and supervision, but all trips are organized and lead by Wilderness Volunteer leaders. There is a participation fee that covers all meals during the project. Each trip is designed to leave time to explore and enjoy the wilderness, and volunteers learn Leave No Trace outdoor living skills and ethics.